The New Norfolk Shell/Coles Express. A SHARP increase in the price of fuel at a New Norfolk petrol station has been the subject of much discussion today. 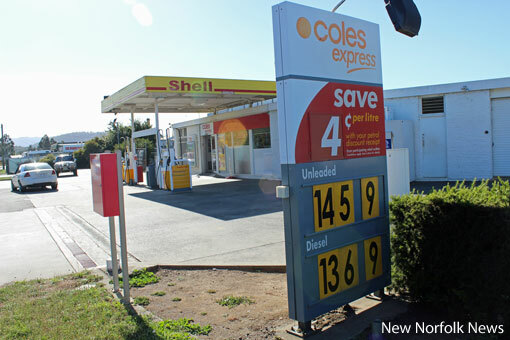 True to the warning issued by the Australian Competition and Consumer Commission late last week, the price of unleaded fuel has jumped 20c per litre at the Shell/Coles Express petrol station in New Norfolk. This adds $10 to the cost of filling a 50-litre tank. 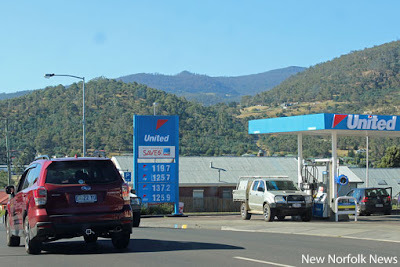 The petrol station's sign board on the corner of Hamilton Rd and Back River Rd shows the price of unleaded fuel to be 145.9 cents per litre, while diesel is showing as 136.9. The change took effect on Saturday and has been replicated at selected Shell sites around the state. Late this afternoon the price at the United petrol station on the corner of Burnett St and Pioneer Avenue was 125.7 cents per litre, or 119.7 for RACT members. The United petrol station in Burnett St, New Norfolk.